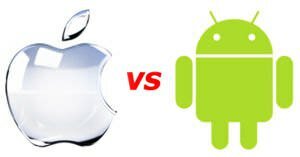 Google's Android and Apple's iOS are operating systems used primarily in mobile technology, such as smartphones and tablets. Android, which is Linux-based and partly open source, is more PC-like than iOS, in that its interface and basic features are generally more customizable from top to bottom. However, iOS' uniform design elements are sometimes seen as being more user-friendly. 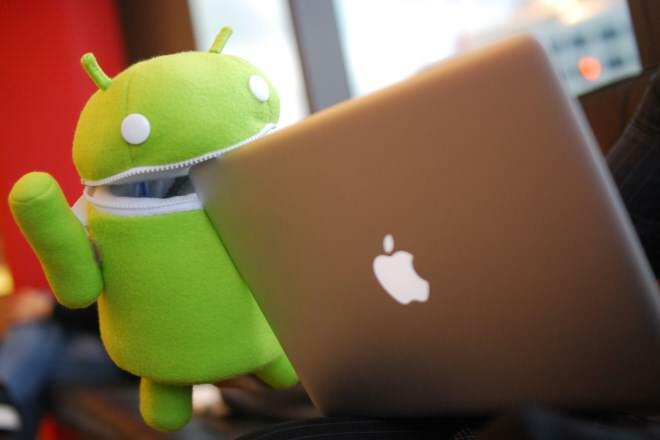 Android software patches are available soonest to Nexus device users. Manufacturers tend to lag behind in pushing out these updates. So at any given time a vast majority of Android devices are not running updated fully patched software. Most people will never encounter a problem with malware because they don’t go outside the Play Store for apps. Apple's software updates support older iOS devices also. iOS and Android both use touch interfaces that have a lot in common - swiping, tapping and pinch-and-zoom. Both operating systems boot to a homescreen, which is similar to a computer desktop. While an iOS home screen only contains rows of app icons, Android allows the use of widgets, which display auto-updating information such as weather and email. The iOS user interface features a dock where users can pin their most frequently used applications. A status bar runs across the top on both iOS and Android, offering information such the time, WiFi or cell signal, and battery life; on Android the status bar also shows the number of newly received emails, messages and reminders. For a similar comparison of Android Lollipop and iOS 8, watch this video. Many different manufacturers make Android phones and they often include some customization over the vanilla Android experience. e.g. HTC Sense or Samsung TouchWiz. Depending upon your device and carrier, there may be pre-installed apps that are bundled with your Android device. Pfeiffer Report released in September 2013 rates iOS significantly better than Android on cognitive load and user friction. Android gets apps from Google Play, which currently has 600,000 apps available, most of which will run on tablets. 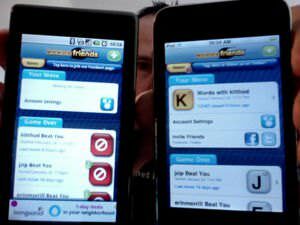 However, some Android devices, such as the Kindle Fire, use separate app stores that have a smaller selection of apps available. Many originally iOS-only apps are now available for Android, including Instagram and Pinterest, and Google’s more open app-store means other exclusive apps are also available, including Adobe Flash Player and BitTorrent. Android also offers access to Google-based apps, such as Youtube and Google Docs. The Apple app store currently offers 700,000 apps, 250,000 of which are available for the iPad. Most developers prefer to develop games for iOS before they develop for Android. Since a recent update, the Youtube app has become unavailable on iOS, but iOS still offers some exclusive apps, including the popular game Infinity Blade and Twitter client Tweetbot. The bottomline when comparing Google and Apple's app stores is that most popular apps are available for both platforms. But for tablets, there are more apps designed specifically for the iPad while Android tablet apps are often scaled up versions of Android smartphone apps. Developers at startups often focus on one platform (usually iOS) when they first launch their smartphone app because they do not have resources to serve multiple platforms from the get go. For example, the popular Instagram app started with iOS and their Android app came much later. Android 2.3 Gingerbread has the highest total crash rate, at 1.7%. Other versions of Android — Ice Cream Sandwich, Jelly Bean, and KitKat — have a crash rate of 0.7%. iOs 7.1 has a crash rate of 1.6%., and the rates for iOS 7.0 and iOS 5 are 2.1% and 2.5% respectively. Phone versions of both Android and iOS are more stable than their tablet versions. Crash rates for apps vary by category — games are most likely to crash (4.4% crash rate) and e-commerce apps have the lowest crash rate of 0.4%. An iPhone 6s handily beat a Samsung Galaxy Note 7 in on speed test that involved opening several apps one by one, cycling through a set of apps twice. The same set of apps were used for both devices. The iPhone was able to complete two laps in 1m21s while it took the Galaxy Note 2m4s to finish the same task. The Samsung Galaxy Note 7 boasts better hardware specs and is a much newer phone compared with the iPhone 6s. However, it should be noted that the difference could be in how app publishers develop their apps for Android vs. iOS. Just because the same apps are on both platforms does not mean their internal workings are the same. Although Google does update Android frequently, some users may find that they do not receive the updates on their phone, or even purchase phones with out-of-date software. Phone manufacturers decide whether and when to offer software upgrades. They may not offer an upgrade to the latest version of Android for all the phones and tablets in their product line. Even when an upgrade is offered, it is usually several months after the new version of Android has been released. 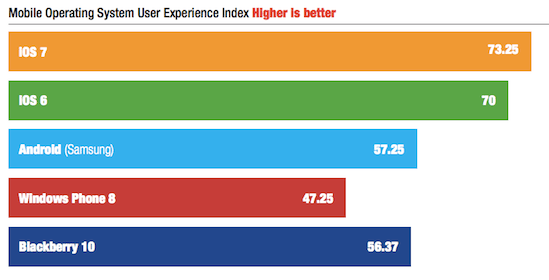 This is one area where iOS users have an advantage. iOS upgrades are generally available to all iOS devices. There could be exceptions for devices older than three years, or for certain features like Siri, which was available for iPhone 4S users but not for older versions of iPhone. Apple cites hardware capability as the reason some older devices may not receive all new features in an upgrade. A wide variety of Android devices are available at many different price points, sizes and hardware capabilities. iOS is only available on Apple devices: the iPhone as a phone, the iPad as a tablet, and the iPod Touch as an MP3 player. These tend to be more expensive than equivalent hardware using Android. Android allows the user to send one of a number of self-composed texts as autoreplies when declining a call. iOS’s phone app has many abilities, including the ability to reply to a phonecall with a canned text message instead of answering, or to set a callback reminder. It also has a Do Not Disturb mode. Android allows users to log onto GTalk for instant messages. iOS does not offer a native way to chat to non-Apple users. Users can message over Apple users using iMessage or use apps from Google for GTalk and Microsoft for Skype. Google Hangouts on Android can also be used for video chat, allowing users to chat over either 3G or Wi-Fi. iOS uses Facetime, which can place video calls over both 3G and WiFi. 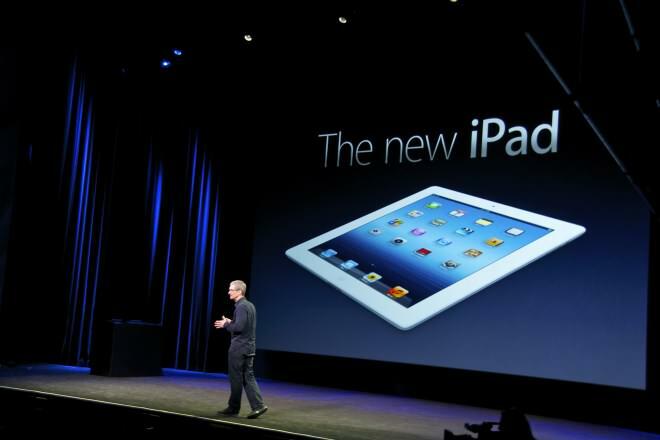 However, it only allows users to communicate with other Apple devices. iOS uses Siri, a voice-based virtual assistant, to understand and respond to both dictation as well as spoken commands. Siri includes many features, such as reading sports scores and standings, making reservations at restaurants and finding movie times at the local theater. You can also dictate texts and emails, schedule calendar events, and interface with car audio and navigation. Android offers a similar assistant, Google Now, which features the above abilities, plus can keep track of your calendar and give verbal reminders when it is time to leave. It allows for voice search and dictation. Apps like Google Maps, Waze and Bing are available for both iOS and Android. When Google released its maps app for iOS in December 2012, the iOS version surpassed the version available for Android in terms of features, design and ease of use. The Android version is not expected to stay behind. Apple's own mapping app, which is bundled with every iOS device, was widely panned when it was launched with iOS 6. Android uses Google Chrome as its web-browser, while iOS uses Safari. Both Internet browsers are similar in quality and abilities and Google Chrome is also available for iOS. Safari is not available for Android. Android is integrated with Facebook, allowing users to update their statuses or upload pictures from many apps, and to pull contact data from their Facebook friends. iOS is also fully integrated with Facebook, allowing users to update their status and upload images from various apps, sync their contacts with Facebook, and have their Facebook events automatically added to their iOS Calendar. iOS now offers much deeper integration with Facebook and Twitter because of how tightly it is weaved into core apps on iOS. Android uses Google Wallet, an app that allows for mobile payments. Some Android phones are equipped with an NFC chip (near-field communication) that is used for making wireless payments simply by tapping the phone at the checkout counter. This service integrates with Google Wallet but is not available on all Android phones or wireless carriers. Mobile payments are supported on devices that have an NFC chip (such as Samsung's Galaxy S4 and S5) as long as they are running a version of Android newer that 4.4 KitKat. The iOS mobile payment system is called Apple Pay. While Apple Pay was launched over a year after tap-to-pay features on some Android phones, its integration with fingerprint identification arguably makes Apple Pay easier to use. Usage of Apple Pay has certainly been significantly higher. In fact, Apple Pay has kindled interest in mobile payments and prompted Android users to discover the feature on their phones, leading to an increase in use of Google Wallet over NFC. iOS offers Passbook, an app that collects in one place tickets, reward cards, and credit/debit cards. Android’s applications are isolated from the rest of the system’s resources, unless a user specifically grants an application access to other features. This makes the system less vulnerable to bugs, but developer confusion means that many apps ask for unnecessary permissions. The most widespread malware on Android is one where text messages are sent to premium rate numbers without the knowledge of the user, and the sending of personal information to unauthorized third parties. As it is the more popular smartphone operating system, it is more likely to be the focus of attacks. Malware writers are less likely to write apps for iOS, due to Apple's review of all the apps and verification of the identity of app publishers. However, if an iOS device is jailbroken and apps installed from outside Apple's store, it can be vulnerable to attacks and malware. Both iOS and Android are also vulnerable to bugs e.g. phones crashing when playing a specific video, which is a type of software bug that has affected both iOS and Android devices. In the real world, the security of an Android or iOS device is only as good as the software updates that have been applied to it. This is where iOS shines because of the fragmented nature of the Android ecosystem. Apple releases software updates and makes them available to all iOS devices at the same time. On Android, Google releases software updates and security patches to Nexus devices. Devices from other manufacturers lag behind because the manufacturer must take these security updates from Google and apply them to their own devices "in the wild". Virtually all manufacturers do a poor job at this. Most don't release patches to devices older than 12-18 months. Even when they do, these security updates are rolled out months after Nexus devices receive them. That Android devices are less secure is also evidenced by this bounty program; a company that obtains security exploits from hackers and sells them to governments has a bounty on 0-day (i.e., previously unknown) exploits for iOS ($1.5 million), Android ($200,000) and Flash ($80,000). The amounts of the bounties are a rough proxy for how easy it is to exploit these platforms in practice. So a security-conscious individual or company should use either iOS or Nexus devices. Both iOS and Android are "vulnerable" to a certain kind of privacy leak: an app installed on either platform can get a list of all other apps installed on the same device. This means your calculator app can find out that you use Tinder and relay that information back to its publisher, who is then free to use this info in whatever way they choose. In November 2014, Twitter announced that it is now tracking the list of apps its users have installed on their phones. Twitter is far from being the only company doing this. 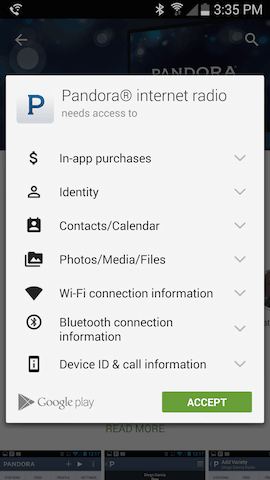 Permissions requested by Pandora's Android app. An Android user cannot use Pandora's app without accepting all of these permission requests. Beyond the list of apps, when it comes to protecting users' private information, iOS wins. Until Android Marshmallow was released in 2015, when installing apps on Android, the user was presented with all the permissions that the app is requesting. This was an all-or-nothing proposition. The user could choose to accept the app's request for permissions or not install the app at all. App developers take advantage of this "feature" and request a lot of user information. For example, Pandora's mobile app on Android requests permissions for your Google identity, contacts, calendar, photos, media, files and even call information. Pandora's app on iOS gets no such permissions. After it is installed and opened by the user, an iOS app may request additional permissions like location and access to Contacts. But the user can reject these permission requests. Even after approving the permission requests, iOS users can quickly glance at which apps have access to their Contacts and location data, and turn off access for apps with which they no longer want to share this data. Android M (or Marshmallow) allowed a new permissions regime where apps could request permissions as needed. However, a majority of Android apps still take the approach of requesting permissions upfront. While it is possible to manage app permissions on Android at a more granular level, this option is buried deep in the settings. Android apps are programmed using C, C++ and Java. It is an "open" platform; anyone can download the Android source code and Android SDK for free. Anyone can create and distribute Android apps for free; users are free to download apps from outside the official Google Play store. There is, however, a one-time $25 registration fee for developers who want to publish their apps (whether free or paid apps) on the official Google Play store. Apps published on Google Play undergo a review by Google. The Android SDK is available for all platforms - Mac, PC and Linux. iOS apps are programmed using Objective-C. Developers must pay $99 every year for access to the iOS SDK and the right to publish in Apple's app store. The iOS SDK is only available for the Mac platform. Buttons:Android buttons are usually monochromatic, with a tendency towards using iconography when possible. The standard iOS 7 button is plain monochromatic text with no background or border. When iOS 7 does use button borders, they tend to be quite simple. The Action Bar of Navigation Bar: The nav bar in iOS is usually just a Back button linking to the previous screen. In Android, the navigation bar usually has several action buttons. Intents: Intents on Android allows applications to flexibly interoperate with each other. For example, apps can "register" themselves as capable of sharing which allows the user to share using this app from any other app. The article outlines several other differences and is a great read. Deeper integration with Facebook and Twitter: it is easier to post updates and share on social networks using iOS than Android because of how deeply integrated these platforms are with iOS. Software upgrades: Apple offers software upgrades to all devices that have the hardware capable of handling the new software. This means devices stay current with software features for at least two to three years. Better privacy controls: iOS offers better control over the access apps have to users' private information such as contacts and location. Massive hardware selection: A large number of Android devices are available at various price points, with varying hardware capabilities, screen sizes and features. Highly customizable user experience: The home screen can be customized with not just app icons but widgets that allow the user to stay connected or informed. Other examples include SwiftKey, which modifies your Android smartphone’s keyboard, and apps that emulate older gaming consoles. Google has fewer restrictions than Apple on what kinds of apps it allows in its Play store. Moreover, you can choose to install Android apps from places other than the Google Play store. Several prominent people have shifted from iPhone to Android. Android's connection to the Google ecosystem of services is strong and arguably more useful compared with Apple's cloud services suite. Excellent, unbiased comparison. Best I've seen in a while. I have been searching for an unbiased comparison and not found one still now. Thank you for your professional and educated take on this issue.